Japanese fish and seafood meals are beautifully presented and normally are made using only the freshest of ingredients. It cannot be emphasised enough that only the freshest fish will suffice and that fish such as mackerel, sardine and cod are not suitable for these dishes. It is also important to use short grain(sticky)rice and not long grain varieties, such as basmati, for the best results. Glutinous rice is also not recommended because it is too sticky. Mention Japanese food to most people and sushi will immediately spring to mind as a typical Japanese recipe. 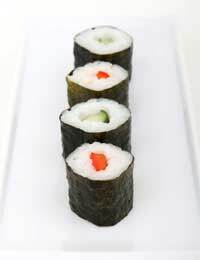 Sushi can be made in under an hour and a typical portion will serve approximately 5 people,presuming they take 2 sections each,which are normally bite size pieces. A cup of short grain rice. Short grain rice is also known as sticky rice and very different to long grain rice,which is not suitable for this recipe. wasabi to taste. This can be quite strong, so use with moderation. First take the rice and wash under cold running water for approximately 3 minutes, then you should drain the rice of all excess water. Next take a pan and heat the rice until it comes to the boil, before simmering for approximately 4 minutes or until all the water has been absorbed. Once this has happened, cover the pan and, at a very low temperature, cook for another 4 minutes. Next remove the pan from the heat and place to one side, still covered, for approximately 8 minutes. Next place the vinegar, sugar and salt in with the rice and mix well together. Continue doing this until the rice has cooled down. You then need to take the chosen fish and cut into thin strips before slicing the cucumber into thin strips. Take a sushi mat and place some greaseproof paper on top of the mat and place a sheet of nori on top of that, making sure the sushi mat is resting on a flat surface. Take approximately a quarter of the rice and place it over half of the nori sheet,along one long side leaving approximately a 3cm gap around the sides. Next take a tiny amount of wasabi, remember how strong this can taste, and spread this down the middle of the rice. You then need to add approximately a quarter of the fish, ginger and cucumber along the line of wasabi. When you have done this roll the nori into a tight roll, starting from the bottom,ensuring that rice and other ingredients inside the nori are firmly held together by the nori sheet. Once rolled the ingredients can be secured by folding the sheet of nori at the bottom. Now all you have to do is cut the nori roll into 3 cm slices and serve. Another popular Japanese fish dish is sashimi. Preparation time for this dish is just half an hour and is relatively easy to make. To serve two, follow these instructions. First take 170g of very fresh fish. This can be snapper, trout, tuna, kingfish, bream or whiting, to name just a few examples. Once you have chosen what fish you would like to use, take a very sharp knife and remove all skin from the fish. Once the fish is skinless place the flesh in a freezer, but only chill, don't freeze, until it becomes firm enough to cut into thin slices that are approximately 4 mm in width. It is recommended that the fish is cut in a one motion action, as opposed to a sawing action. Next take half a carrot and half a daikon and slice into long strips. The sashimi pieces should then be arranged on a plate before using the carrot and daikon as garnish. As with sushi, some fish such as mackerel, sardine and cod are not suitable for sashimi.